It’s with good reason that New Zealand has come to be most famously associated with striking scenery. Not only does the country boast impressive landscapes, but it’s possible to pass through massively diverse regions in a matter of hours. Visitors flock there year round to go tramping on some of the world’s most beautiful trails, but there are plenty of other ways to enjoy the fresh air in the 5 most scenic parts of New Zealand. 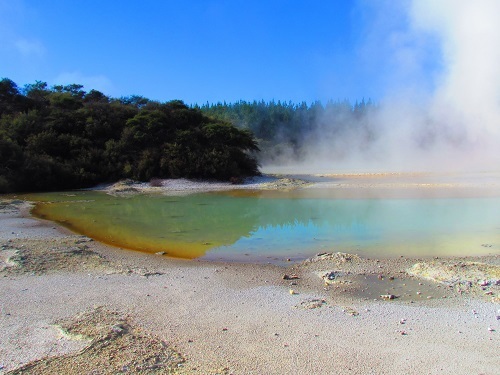 While the South Island receives most of New Zealand’s praise for being pleasing to the eye, there’s nowhere quite like the thermal parks of Rotorua on the North Island. The best way to see them is by taking a day trip to Wai-O-Tapu and Waimangu. After a guided tour of bubbling mud pits and active geysers, you will be free to stroll among eerie sink holes and iridescent pools. The parks provide a wealth of information about the formation of these natural wonders as well as the local animal and plant life. You can take the boardwalks at your own pace and there’s even the option of a cruise on the lake at Waimangu. 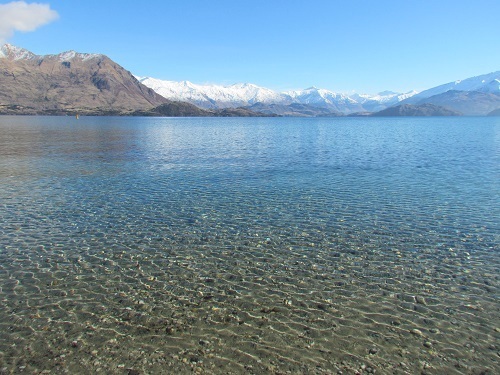 Central Otago first attracted European settlers when gold was discovered in 1861. Panning in the rivers claimed many lives and, eventually, the practice died out. More recently, the surprise discovery that vineyards fare very well in the local climate has led to a surge in the number of wine-producers setting up camp, some of which have won awards and worldwide acclaim. Arguably the biggest generator of income for the area, though, is tourism. Queenstown and Wanaka are packed in the winter with snow sports enthusiasts, but all year round, you can amuse yourself with water-based activities, scenic flights, Segway tours and even the world’s first commercial bungy. 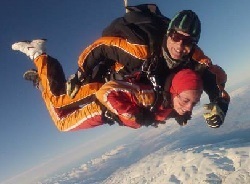 But by far the best way to take in views of the whole region is to pick a clear day, strap yourself to a beautiful stranger and jump from a plane at 15,000 feet with Skydive Wanaka! The obvious attraction in Kaikoura is the wildlife. Tourists and holidaymakers would be foolish to miss this coastal gem off their itinerary. If you’ve never seen whales in their natural habitat before, take a boat out for a few hours and watch them breaching and tail slapping as they communicate their position to the rest of the pod. If you feel like something more interactive, you can swim with dolphins. Sometimes there are up to 500 around the boat and they’re very playful. If you don’t have the finances or the weather prevents boat trips from setting off, visit nearby Ohau Point for a stroll through the woods where adorable seal pups are left to play while their mothers go to feed. 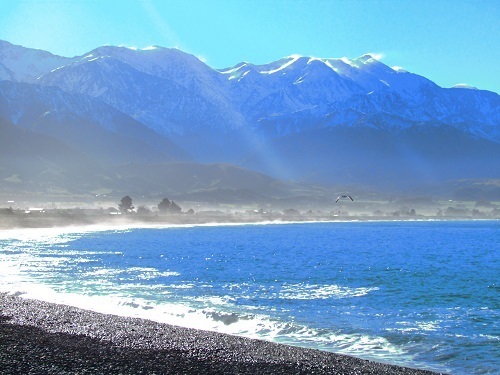 Or, you could just sit on the shingle beach and gawp at the sun-drenched mountains that surround the bay. Until you actually stand on a glacier, it’s hard to imagine the effect it will have on you. Once you’ve had the chance to explore its tunnels, caves and fissures with a pair of crampons strapped firmly to your boots, it will probably go down as one of the most memorable experiences of your life. The Ice Explorer hike on Franz Josef glacier with Fox and Franz Josef Glacier Guides involves a brief helicopter ride followed by a couple of hours’ guided exploration. 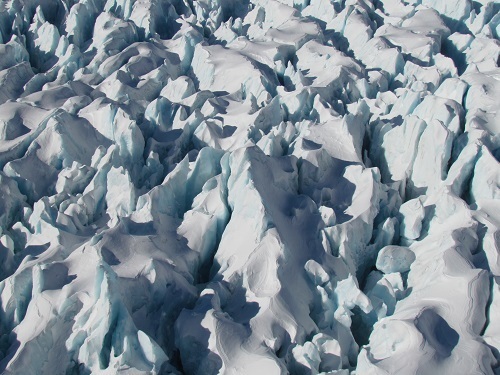 Alternatively, you can view both glaciers as well as New Zealand’s highest peak – Mt Cook – on a scenic helicopter flight with Fox and Franz Josef Heliservices. It’s an opportunity you won’t have many times in your life, especially given the lifespan of most glaciers. At its current rate of retreat, Franz Josef will be gone in 30 years. 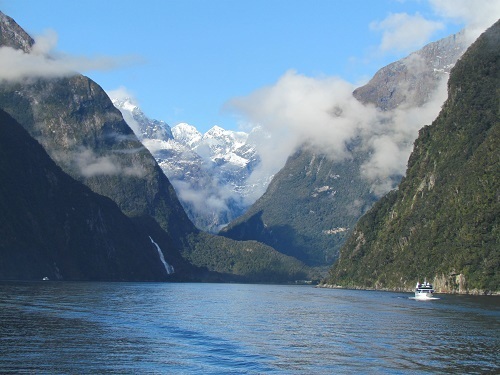 Milford Sound is one of New Zealand’s most famous destinations. While you can drive there yourself, a lot of people take guided tours while using Te Anau or Queenstown as a base. Real Journeys have specially designed buses with glass roofs and their seats angled towards the windows so that you get the best views possible. Once on the boat and cruising through the sounds, you can’t fail to be in awe of the towering cliffs and misty waterfalls. You also have the chance to spot seals and dolphins and to go kayaking in the summer months. While the round trip from Queenstown is over 13 hours long, it’s definitely worth the early morning, and your bus will stop regularly at other places of interest so you can stretch your legs. Don’t miss the perfectly reflective Mirror Lakes on your way there. If you would like to see the scenic sights of New Zealand for yourself then take a look at our New Zealand sale. We have flights from £749, holidays from £965 as well as adventure tours, self-drive holidays and luxury holidays available. Arianwen Morris is the publisher of the travel blog Beyond Blighty – a collection of anecdotes, tips and advice for the independent and adventurous budget traveller. She has just completed a six-week adrenaline-fuelled tour of New Zealand. You can follow her adventures on Twitter with the handle @BeyondBlighty or the hashtag #ScaredBritless.